As April sunshine melts the last patches of snow, hungry locavores slip on their mudboots and head into the woods. Peering into shaded groves and soggy fields, these foragers are looking for a taste of the changing season, a brightly flavored reminder that summer is on its way. For a few short, exhilarating weeks, spring is fiddlehead season. Fiddleheads are tightly spiraled fern fronds, not yet unfurled. In the central and northeastern United States, the ostrich fern is the most popular variety; elsewhere lady ferns or other species are harvested. Like other wild harvested foods, such as ramps and nettles, fiddleheads have gained popularity in recent years and make brief appearances on the springtime menus of many restaurants. Foodies have rediscovered fiddleheads for good reasons. They’re high in fiber, iron, and healthy omega-3 fatty acids, and their sunny taste entices our winter-weary taste buds. 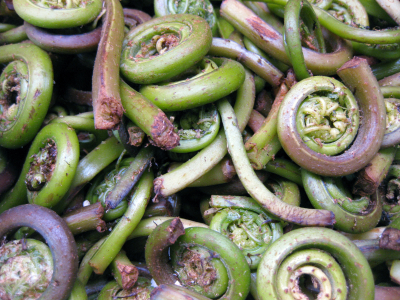 When young and freshly picked, fiddleheads have a delicate, grassy flavor reminiscent of asparagus. The curled, slightly fibrous rib of the fern lends a pleasant substance and bite, while the tiny leaves are meltingly tender. If you live in an area where ostrich ferns grow, as I do, the best way to hunt them is to tag along with a foraging friend who can show you the ropes. Bring along a sharp knife or scissors, and a bag to carry your hard-won treats home. You’ll need some good boots, too; fiddleheads thrive in moist, shady environments, and are often found in low-lying marshy areas or along riverbanks. Wherever you find them, it’s important to harvest them sustainably, so that the ferns will continue to thrive. A common rule of thumb is to take no more than three fiddleheads from each plant, leaving plenty of fronds intact to unfurl and grow as summer approaches. Responsible foragers also keep a close eye on the overall health of fern populations. If an area becomes so popular among greens-hungry locals that the ostrich ferns are diminishing, it’s time to find a new spot. Fiddleheads are best soon after they’re harvested, so when you’ve got a few, head home to swap your muddy pants for an apron. To clean the ferns, remove the papery skin that covers one side of the frond. Next, wash them in several changes of cold water, until the water runs clear. Even if you plan on sautéing the fiddleheads, it’s a good idea to pre-cook them in boiling water. While not everyone is affected, there have been cases of food poisoning from to eating undercooked fiddleheads, which boiling can help prevent. Immerse the fiddleheads in a large pot of rapidly boiling water until just tender, about five minutes. Immediately dunk them into a bowl of ice water, and drain before using. A traditional Indonesian dish, gulai pakis, combines the bright taste of fiddleheads with a heady mix of galangal, hot peppers, turmeric leaf, and lemongrass, simmered in a broth of rich coconut milk. Fiddleheads also pair wonderfully with creamy cheeses such as fontina and ricotta, and are perfect atop a crispy homemade pizza or rich pissaladière. As the days warm and the fiddleheads begin to uncoil, I mourn the passing of the brief moment when they rule the kitchen. Long weeks before plump tomatoes and succulent melons ripen, humble ferns are the star of the show. For me, the ephemeral fiddlehead evokes one of cooking’s most vivid lessons: that food is best when prepared with spontaneity and verve, as a celebration of the season.